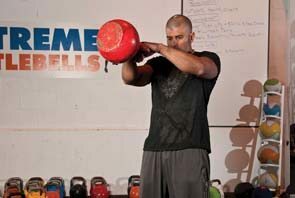 Leading strength coach Mike Mahler shows us how to use kettlebells with confidence. The kettlebell revival is in full swing, and since these traditional Russian weights re-emerged as a training tool, the way they are seen by regular gym-goers has changed significantly. A few years ago, people looked at the strangely shaped objects, weren’t sure how to use them properly and ultimately steered well clear. Now they look at the strangely shaped objects and still aren’t really sure how to use them — but they give them a go anyway. 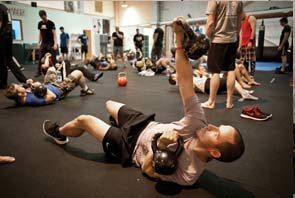 So while the popularity of kettlebell training has rocketed, understanding of good technique is lagging behind. That’s why MF has come to get the lowdown from leading kettlebell coach Mike Mahler, who is over from the US to teach a two-day workshop for trainers and bell (the aficionado’s term) lovers. We’ll be doing basic moves on day one, then more advanced double bell and stacked (two bells in one hand) stuff on day two. I think my technique is pretty good, so I’m expecting to breeze through day one, although I might struggle in day two. But straight away I realise that my swing, the most basic move, is fundamentally flawed. “Don’t let the bell pull you forwards because that will hurt your back,” says Mahler. He advises me to retract my shoulders and avoid locking my elbows at the top of the move. We also do a drill in which we swing the bell, but keep our arms close to our sides to make sure power comes from the hips, rather than using your arms and shoulders. 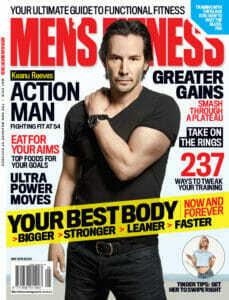 “If you swing the kettlebell away from your body too early that puts stress on your lower back,” he says. We continue to work our posterior chains by doing drills for one-hand swings, cleans and snatches. 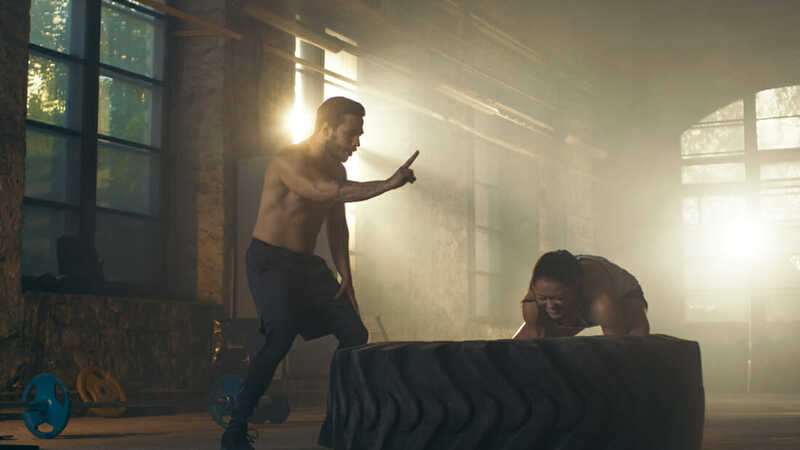 Mahler also likes supersetting moves and pairing the renegade row with the rolling floor press (see over the page for form guides), which works your chest and back while hammering your abs and getting virtually every other muscle in your body to help stabilise the movements. They’re fun, full-body moves and look cool too. Day two is significantly harder and using two kettlebells instead of one seems to be more than double the difficulty. We start with a stacked press, which means shoulder-pressing two kettlebells in the same hand. It may look like it’s a show-off move, but there’s a sound reason for doing them. I manage to clean two 16kg bells into position but I’m struggling to press them overhead. Mahler, not surprisingly, has no such difficulty and demonstrates a double-stacked press with two bells in each hand. An easier double-bell move is the bent-over row hold, in which you row one weight up to your side, then do reps with the opposite arm. “The ability to hold the weight in a contracted position will make you stronger,” he says. Sadly, it doesn’t make me immediately stronger, so when I do the next move, an iron cross (where you start with two kettlebells overhead, then slowly lower them out to the sides before raising them overhead), I manage to lower two 16kg bells down to the side, but they’re not going back up again. After two days of swinging, pressing, cleaning and snatching, my nervous system is feeling a lot more fried than fired up. But I finally feel as though I have nailed the basics of using kettlebells with confidence. And one day that stacked press will go up. The two-hand swing is the most fundamental kettlebell move. Here’s how to perform it properly. > Bend your knees slightly, pushing your bottom back, to get into the starting position. Make sure that your back is flat and keep your head in a neutral position. > Swing the kettlebell between your legs forcefully as if you were passing a ball to someone behind you. Quickly reverse the direction and drive through with your hips, taking the kettlebell to chest level. 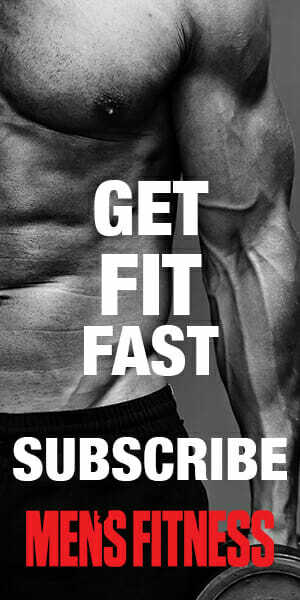 > Let the kettlebell swing back between your legs and repeat. > Remember that the swing is a posterior-chain exercise and this is where all the power is generated — it’s not a front raise. 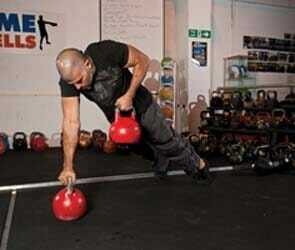 Mike Mahler is an internationally renowned kettlebell expert and the founder of Mahler’s Aggressive Strength. He specialises in hormone optimisation for fitness and health and is the author of Live Life Aggressively: What Self-Help Gurus Should Be Telling You. For more info visit mikemahler.com.